Circulating Now welcomes guest bloggers Diane Wendt and Mallory Warner from the Division of Medicine and Science at the Smithsonian National Museum of American History. As curators of our most recent exhibition, From DNA to Beer: Harnessing Nature in Medicine and Industry, Diane and Mallory spent months researching four different microbes and the influence they’ve had on human life. One of our favorite objects in the exhibition From DNA to Beer is a bag of dirt. This “dirt bag” (as it was affectionately dubbed by Library staff) was donated to the Smithsonian in 1953 by the pharmaceutical firm Charles Pfizer & Company and its story is delightfully told in the book Our Smallest Servants (Charles Pfizer & Co., 1955). The main delight in this book lies in its imaginative illustrations beginning with the array of Petri dishes on the cover and the cut-away circle and culture of “mold” that follows you as you page through the book. Further on in the book we learn that the name of this mold is Penicillium chrysogenum. This particular microorganism was recovered from a moldy cantaloupe purchased at a market in Peoria, Illinois in the early 1940s. The rotten fruit was taken to a nearby government laboratory where researchers were working around the clock to try to find ways to mass-produce penicillin. The antibiotic, which is produced by the Penicillium mold, was first discovered in 1928 by Alexander Fleming. However it was not yet a useful medicine because it could not be manufactured on a large scale. To give a sense of the magnitude of the problem, the author relates that in 1939 you could recover more gold from ordinary seawater than penicillin from a Penicillium culture. One of the first new penicillin plants built during WWII included 15,000 gallon fermentation tanks for growing the mold. And so we have a wonderful story about a moldy fruit … but what about our dirt bag? 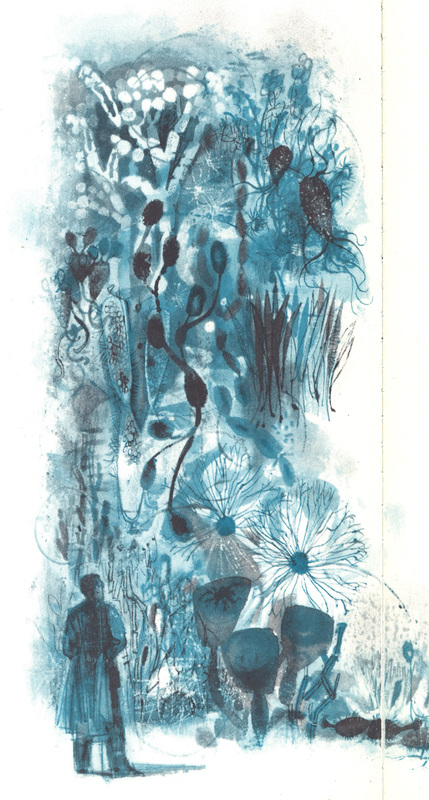 This fanciful illustration from the book of the lush microbial world is one of our favorites. At the same time researchers were working on penicillin, scientists at a laboratory at Rutgers University were busy studying the properties of microorganisms isolated from the soil. The scientists laboriously cultivated thousands of samples before they found the bacteria Streptomyces griseus, which yielded an important new antibiotic, streptomycin. Streptomycin was effective against many bacterial infections that were resistant to penicillin including Mycobacterium tuberculosis, which causes tuberculosis. And finally we find our dirt bag—one of the many soil samples collected and screened by the Pfizer Company. Ironically, although they collected soil from all over the world – as alluded to in this illustration from the book – the winning dirt was found almost literally in their backyard. 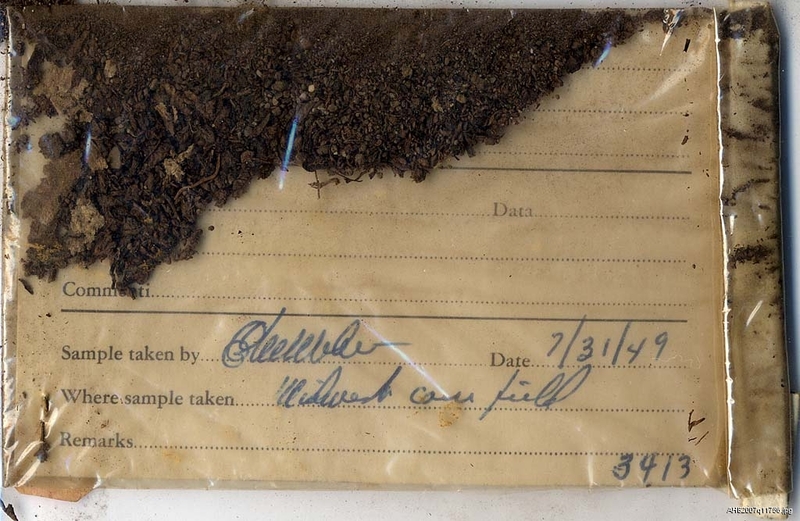 The bag of dirt donated to the Smithsonian and now on display at the National Library of Medicine contains some of this sample. Terramycin proved to be effective against a wide range of diseases—nearly one hundred—including typhus and Rocky Mountain fever. We last meet our mold among a field of cattle, as our story relates how antibiotics such as Terramycin were found to be effective growth promoters. When animal feed is enriched with antibiotics, livestock such as poultry and swine “reach market size sooner, and on less feed.” More meat for the money is one way to look at it. Cows by a large barn complex. We don’t know the end of the antibiotic story, but we do know that it has become increasingly complicated over the years since the publication of Our Smallest Servants. Already by the mid 1950’s concern arose over penicillin residue in milk, and the Asian flu pandemic of 1957-58 introduced the public to the emergence of antibiotic resistant microorganisms. Responsible antibiotic use has been a subject of debate ever since, and recently the FDA has issued new guidelines concerning their use in animal feed. Our relationship with “our smallest servants” continues to evolve. Explore From DNA to Beer: Harnessing Nature in Medicine & Industry online for yourself at http://www.nlm.nih.gov/exhibition/fromdnatobeer/index.html. To book the traveling exhibition or see when it comes to your town, visit the traveling exhibition page at http://www.nlm.nih.gov/hmd/about/exhibition/fromdnatobeer-bookinfo.html. Read more posts in this series here. Thanks very much for your comment. You’re right this is a topic of much conversation and debate in today’s science news. Nice sharing. I’ve read many of your posts, and learned a lot, thanks. Thanks! Glad to have you here reading and learning!